As a new dog owner, it’s vitally important that you start bonding with your dog as early as you can. Building that bond of trust and mutual respect is easier the sooner you start, and is vital for your dog. Not to mention your peace of mind! Bonding with your dog is important because the habits and behaviors that you instill when doing so naturally flow into all other areas of their lives. For example, when you’re building that relationship with your dog you’re teaching them how to play properly without biting, how to socialize with other dogs, how to cope with strangers, and so on. And the secret to a great relationship between you and your dog is trust. Your dog must completely trust you and look upon you as the pack leader. And while you can to some extent train your dog out of some bad habits when they’re older, it’s much easier when they’re still young. So how do you build this bond of trust between you and your dog then? Well, there are a number of things you can do but one of the most important and effective is to make sure you always use positive reinforcement when training your dog. Reward their good behavior with plenty of hugs and kisses and treats. Conversely, don’t shout or hit them when they don’t behave as you wish. This is the worst thing you can do, as your dog will become fearful of you and will never trust you. 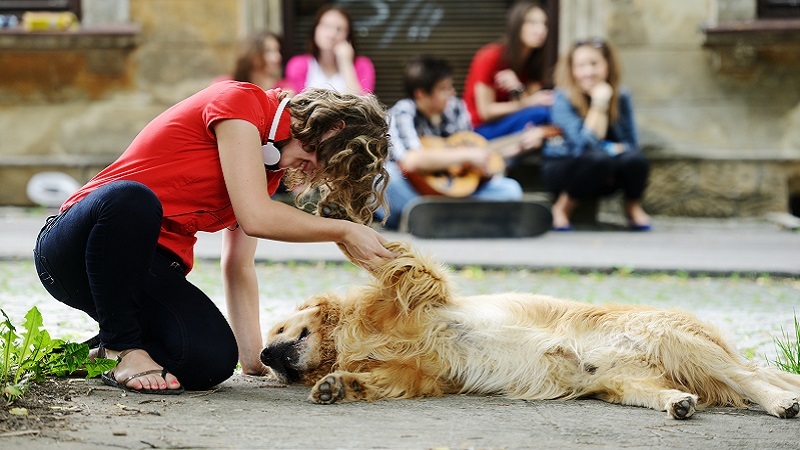 Another area of building a bond with your dog that is extremely important is socialization. You need to expose your puppy to both other dogs and people from an early age. If you don’t, your dog will grow up to be nervous and fearful of others and will likely react to them aggressively by barking and snarling. And once they form that outlook, it’s very difficult to get them out of it. On the other hand, early exposure to others teaches your dog there’s nothing to be afraid of and gives them a positive view of strangers. And this means they’re likely to greet them with a friendly wag of the tail rather than with aggression. Taking your dog to the park where other owners walk their dogs is a great way of doing this. Make sure you keep your dog on the leash until they get used to others, and don’t force them to interact with others if they show signs of nervousness. Some dog breeds are naturally more outgoing and friendly than others, so socialization will be easy for some dog owners while others may have to work harder. If your dog is particularly nervous around people and dogs, keep them well away at first and gradually move them closer. For example, stand near the entrance to the park and let your dog just stand and watch the others for a while and then keep moving closer, stopping if your dog shows any sign of getting nervous or afraid. All dogs have different personalities, even within breeds. So try to make sure your environment matches your dog’s personality. For example, if your dog is bright and lively and full of energy, loving to play, then provide a similar environment. Make sure they get plenty of play time with you, and that you do lots of exciting things together. This could be playing in the garden, going to the park and playing with other dogs, even going running together. On the other hand, if your dog is naturally quiet and nervous, try to provide them with a calm, relaxing environment that’s quiet and peaceful at first. Then you can slowly get them used to a more lively environment full of noise. So start taking them to the park to watch other dogs as described earlier, take them for gradually longer walks in noisier places where they’ll get used to more traffic and strange people, and so on. Bonding with your dog and learning to trust each other is a vital part of raising a puppy. If there’s no bond or trust between you, your dog is likely to develop behavioral problems and a negative view of other people and dogs. So take the time to make sure you develop this bond from an early age.